AUSTIN, TX - Today, Lt. Governor Dan Patrick announced Senate committee assignments for the 86th Legislative Session. Senator Juan "Chuy" Hinojosa will serve as Vice Chair of the Senate Finance Committee for the six consecutive session. He will continue his appointments to the Senate Transportation Committee and the Senate Committee on Natural Resources and Economic Development. 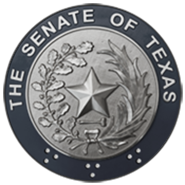 Senator Hinojosa has also been appointed to the newly created Senate Committee on Property Tax and the Senate Committee on Agriculture. Senator Hinojosa's continued appointment as Vice Chair of Senate Finance and his new appointment to the Property Tax Committee secures his influential leadership position and his significant impact on the state budget-writing process that will benefit the South Texas region. "I am honored that Lt. Governor Patrick has again entrusted me with the important responsibility of serving as Vice Chair of Senate Finance. I look forward to working with Chair Nelson, the committee members, and House Appropriations to craft a state budget that addresses our state's needs and makes the investments necessary to continue Texas' economic growth. I am also privileged to have been named to the new Property Tax Committee. Finding a solution to skyrocketing property taxes that is fair, equitable, and meets the needs of Texans is a priority. It is a real problem when the property tax bills being paid by our working families are as much as a mortgage payment. Our families should not be priced out of their homes because of a broken tax system. As in past sessions, there will not be enough money available to do all the things we would like. However, I am committed to working with my colleagues to find ways to fund education and essential healthcare services, invest in our youth and workforce through education and skills training, create more jobs, and invest in the infrastructure we need for future success. South Texas continues to grow and I am pleased that through my committee appointments I will be able to keep the needs of our region at the forefront. I look forward to working with my Senate and House colleagues to bring forth practical solutions that will benefit our Texas families and ensure our state's continued prosperity."